Terrafirma have advised us that they will be making some changes to their pricing on 1st September 2018. This includes price increases for a select number of site size bandings on their Coal Extra reports, as well as the introduction of a new site size banding for their Assess reports. These changes will be applied automatically to any orders made on tmconvey on or after 1st September. The Law Society is making some important new changes with respect to Mining and Natural Ground Perils which will be covered in the soon to be released 25th Edition of its Conveyancing Handbook. Mining and ground report specialist, Terrafirma, is launching a three-part coffee-break webinar series to ensure that you have all of the relevant information at your fingertips. Starting on Tuesday 11th September and led by Terrafirma CEO, Tom Backhouse, they will be no more than 15 minutes in length and are designed to give you all of the necessary information including what the changes are, how they impact you and what the benefits are to you and your clients. Please register your interest and attendance for each webinar via the following links. A download of the webinar will be made available to pre-registered attendees following each event. Please note you can also include this webinar attendance in your Annual Compliance Declaration to the SRA. From Chalk in the South East, to Fireclay in Yorkshire, mining risks vary dramatically across the UK. Here are some regional facts and figures to help you better understand the ground beneath your client’s doorstep, as well as your own. Watch our Mining Risks : Are you prepared? webinar to find out more. *This is the highest number of sinkhole appearances in the last 24 months across England and Wales. *This is the highest number of Recorded Coal Mine Entries (Coal Authority) in England and Wales. Our "Mining Risks : Are you prepared?" webinar - featuring Tom Backhouse from Terrafirma, alongside Clare Yates from tmgroup - discusses how new data sets are challenging traditional assumptions about mining risks. Human activity has had a disastrous impact on ground stability, inflicting misery on unsuspecting victims across the UK and beyond, as sinkholes continue to open up in the voids where our ancestors once mined the mineral-rich earth. This is not a new problem, but the sheer scale of it and the costs involved of it are increasingly making the headlines – and took centre-stage in the second episode of the documentary series that aired this week : “Sucked Under”. A sinkhole that opened up in Newcastle upon Tyne was just one example of how the costs and complications can quickly spiral out of control. In Gosforth, residents awoke to a 30ft deep sinkhole at the end of a driveway, which turned out to be an entrance to a disused coal mine that had been capped and forgotten over 100 years ago. 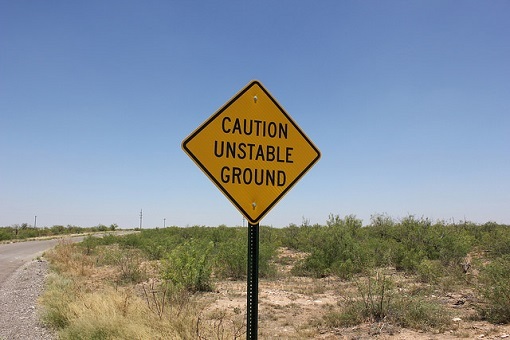 Unfortunately, a large, unstable sinkhole can’t just be filled in overnight. From digging it out and backfilling with rock, to topping it off with 65 cubic metres of reinforced concrete, it took 7 months to make the Gosforth sinkhole safe again – at an eye-watering cost of £300,000, as well as ongoing inconvenience and worry for residents. …And this isn’t just a residential issue. Following the discovery of an abandoned chalk mine beneath Pinner Wood School in 2015, the school has been closed for almost 2 years, whilst extensive work took place to fill the voids and make the school safe to use again. However, it is not always possible to fix the problem and, as seen in the case of Jacqueline Close over 50 years ago, entire streets can end up being demolished following the discovery of unstable, abandoned mines beneath the properties. The problem isn’t isolated to the UK either, as revealed in the case of Bayou Corne, Louisiana. Following extensive salt mining activity over 40 years ago, 58 caverns were left behind once the brine had been successfully extracted. When one of them failed in 2012, 1,000 tons of earth and trees were sucked underground in a void the size of 2 football pitches. The nearby town was quickly abandoned and only 15 of the 159 residents now remain in the once-idyllic ghost town. The mining company has denied responsibility, and only time will tell if another of the 57 remaining caverns will also fail. Terrafirma are working across the UK to understand the ground and provide detailed information to conveyancers and their clients. • TerraSearch® Coal Extra is a regulated ‘Con29M-Compliant’ coal mining search offering an equivalent to the Coal Authority report, including a professional opinion of all coal mining risks and CON29M questions and additionally alerting to 55 further mining hazards. • TerraSearch® Assess is a single search that comprehensively assesses the risk to a site (property and land) from all 60 mining hazards, including past, present and planned extraction. Terrafirma have also released new interactive mapping tools to make it easier for the general public and their conveyancers to see the full extent of the risks beneath their door steps – simply by adding in their postcode. Imagine being told that you only have 15 minutes to pack a bag and leave your family home. That’s the reality residents of Ripon, North Yorkshire, faced back in 2016 when a sinkhole opened up and swallowed their garages, outhouses and even their garden plants. All in all, 10 houses were evacuated and it took 46 months to rebuild their gardens – and their lives. That was just one of the many cases explored in the new 3-part TV documentary series “Sinkholes”, which aired this week on Channel 5, revealing the true extent of sinkhole devastation. Additional cases included yet another sinkhole (35ft deep!) in Ripon that had split a house in two, as well as a housing estate in Hemel Hempstead that had been evacuated when a sinkhole not only damaged houses and roads, but damaged pipes and threated a gas leak explosion! While these incidents are barely comprehendible, they are superseded by the devastation routinely experienced in Florida, where sinkholes have been known to swallow entire houses in less than 30 minutes – and even cost lives. So what is causing all of these problems? Although thousands of miles apart, Florida and Ripon have one thing in common : The ground beneath their homes is made of a substance that dissolves in acid rain. For Florida, this is Limestone. For Ripon, Gypsum. Over time, water trickles underground, dissolving the rock and creating caverns. When the weight above them gets too much, the ground collapses into the void creating holes on the surface that take anything and everything down with them. While these cases certainly make for scary reading, the fear of the unknown is even harder to live with – especially for residents of Ripon and Florida who know it is a question of ‘where’ and not ‘if’ another sinkhole will open up in their neighbourhood. Fortunately, The British Geological Survey are working extensively in areas such as Ripon to map a true picture of the land beneath the ground. Similar bodies in America are making good use of technology and data too, to help ensure that new houses won’t be built in areas of high risk. Are you making dangerous assumptions about local mining risks? We're testing conveyancers assumptions about mining risks in the UK by asking “What percentage of all mining-related ground stability risks does coal mining account for?”. The results are still coming in. However, it is expected that the poll findings will support the long-standing assumption that coal mining is the prime ground stability risk that conveyancers need to be concerned about. Beyond this, it is typically considered that properties across Wales and the North East are the most likely to be affected. Yet such assumptions are causing some conveyancers to ignore the mining alerts triggered when ordering searches against their client’s properties; assuming that they are safe. Rather worryingly, examples of sinkholes opening up miles away from these traditional coal mining sites are beginning to suggest that this is far from the truth, as recently seen in Cheltenham, Liverpool, Sudbury and London. The latest TerraSearch products from Terrafirma are challenging this perception too. Drawing on Terrafirma’s specialist knowledge in the innovation and provision of mining-instability risk assessment, the TerraSearch product suite analyses coal mining risks alongside an additional 55 mining hazards to reveal a fuller picture of ground stability in our towns and cities. Both TerraSearch® Coal Extra and TerraSearch® Assess include additional professional interpretations, as well as a TerraSearch® Coal & Brine Report Indemnity Policy up to £50,000 loss in market value of the property (in the event that a conclusion changes based on the addition of new data), and £10 million liability per report in the event of wrong or missing information. TerraSearch® Coal Extra and TerraSearch® Assess are also supported by a TerraSearch® Alert, which will be available on tmconvey from Friday 20th October. You can see a TerraSearch® Coal Extra sample here and a TerraSearch® Assess sample here. Get in touch with your Account Manager for more information. Take part in our quick poll “What percentage of all mining-related ground stability risks does coal mining account for?” and find out if you too are making dangerous assumptions about local mining risks. “Until recently, hazards such as sinkholes, subsidence and ground instability were seen to be a generic physical risk that could not be practically actioned, did not affect a property transaction and held no tangible links to any financial or legal liability. This perception was down to a lack of innovation in both the data and modelling of risk within the ground, both of which have been developed into due diligence practice already for flood and contaminated land. Recent observations show a much more risk averse nature from the banks to certain ground hazards that were not perceived historically as being a block to a transaction. Mine entries, mineral planning, Mines and Minerals on title, slope stability and coastal erosion to name just a few have all experienced a recent change in policy and significant increase in lender refusals. Tom Backhouse will be part of our guest speaker line-up at our Risky Business Roadshow events this November, which will explore how firms can better protect, prepare and promote their businesses. 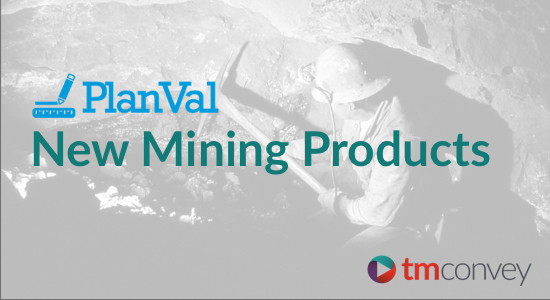 PlanVal mining alerts are now available on tmconvey. The new MiningCheck Alerts assess a property against a wealth of data to alert conveyancing solicitors and their clients to the materials that have been mined on the land; both recently and historically. The new MiningCheck Alerts enable conveyancing solicitors to advise their clients as to whether it is necessary for them to order a complete Coal Mining Search or Non-Coal Mining Search before proceeding with their purchase. Isn’t mining just a risk in Cornwall and the North East? According to PlanVal data, there are mining risk areas in every county in England and Wales; with 34% of land being in a mining risk area. Mining risks are not just a problem for home movers in the North and the Midlands (coal), or in Cornwall (tin), as 63 minerals have been mined, quarried or extracted across England and Wales. These new MiningCheck Alerts enable solicitors to confidently advise whether a client’s property is situated in a mining risk area; even when it isn’t overtly obvious. If you have any questions, please talk to your Account Manager for more information, or contact Helpdesk on 0844 249 9200 or helpdesk@tmgroup.co.uk. These products are being added to the range of mining products on tmconvey in replacement of PlanVal’s current range of mining products, and are both accepted by Banks and Building Societies. These checks are also part of PlanVal's branded products, combining data with a professional recommendation from Mining Searches UK, backed by Professional Indemnity Insurance cover. The standardised format of the search puts a colour coded ‘Passed’ or ‘Further Action Required’ result on the front cover. There follows a Professional Opinion based on definitive Official data provided by The Coal Authority, facilitating decision making. This Coal Mining Search also utilises enhanced datasets from Third Party sources in order to provide an assessment of risk of mine related settlement or subsidence. The report considers information in order to answer questions as set out in CON29M. Each search includes a professional interpretation covered by £10m of professional indemnity insurance. The search returns a rating of: "Passed" or "Further Action", together with opinion details and where necessary, further action required. Input mapping is supplemented by an Ordnance Survey MasterMap ‘Location Plan’ and a large scale ‘Mining Activity Plan’ for clarity and accuracy. PlanVal Non-Coal Mining Search with Professional Opinion. The standardised format of the search puts a colour coded ‘Passed’ or ‘Further Action Required’ result on the front cover. There follows a Professional Opinion based on data on 60+ different mineral types (excluding Coal), facilitating decision making. This Non-Coal Mining Search utilises datasets from both Official and Third Party sources in order to provide an assessment of risk of mine related settlement or subsidence. Where a property lies within a risk area for either Cheshire Brine or British Gypsum, the appropriate official search is purchased. The PlanVal report considers this combined information to produce a clear opinion. Each search includes a professional interpretation covered by £10m of professional indemnity insurance. The search returns a rating of: "Passed" or "Further Action", together with opinion details and where necessary, further action required. Input mapping is supplemented by an Ordnance Survey MasterMap ‘Location Plan’ and a large scale ‘Mining Activity Plan’ for enhanced clarity and accuracy. Note - The standard disbursement is added in the small % of cases where a Cheshire Brine or British Gypsum report is included.